Upon final demolition of the Fogarty building in Downtown Providence, construction of a new nine-story hotel has begun. Owner of the property, Procaccianti Companies, Inc., says they bought the vacant City-owned half-acre property about a decade ago due to its central location. 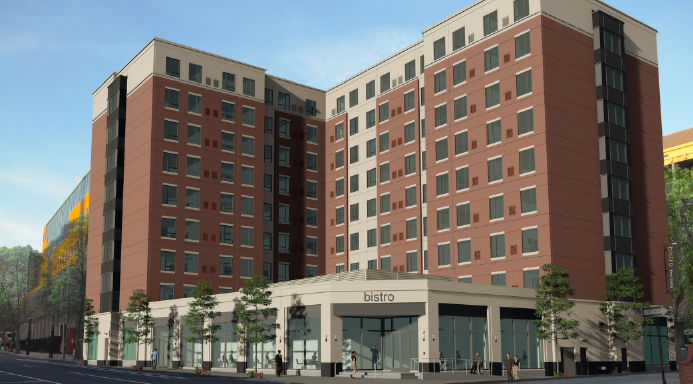 The new 19,380 square foot, high-rose hotel will be comprised of 176 rooms. It will include a fitness center, small meeting rooms, Wi-Fi areas, a spacious ‘socially inspired’ lobby, valet parking and ample off-street parking. It also includes an attached, single-story retail space ideal for a restaurant use. “Given its close proximity to the Convention Center, we’ve received multiple inquiries from high-end restaurants and retailers interested in the space,” said Voccola. The team, made up of AVID Engineers, DiPrete Engineering, Gilbane Building Company, and Vision 3 Architects, is currently finalizing exterior foundation walls and pilings with vertical construction set to commence within the next 30 days. The hotel’s exterior has been designed to aesthetically fit the fabric of the surrounding area.